Hey girl, your boyfriend has been anointed the "Coolest Person of the Year" by Time magazine, but you probably already knew that. 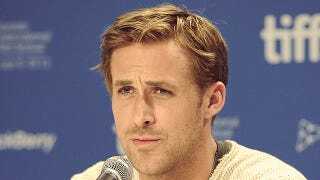 It was pretty disappointing when Ryan Gosling was overlooked for the title of "Sexiest Man Alive," but "coolest" has a lot more indie cred, and might be a better fit. Have you had your Feminist Ryan Gosling today? The 2011 Coolest Person of the Year is a man who is tough but emotional. A movie star who broke up a fight on the streets of Manhattan and was also caught walking down a Manhattan street playing a Strumstick, which is like a ukulele only ukulelier. An Oscar nominee who also smokes, tags graffiti and has a predilection for posing with a fist to the camera but makes dioramas and takes public ballet classes alongside little girls too. He's the only actor since Andy Kaufman to work as a waiter after making it in show business. One who has a rock band that spent a month accompanying a children's marionette show in Los Angeles. He is a man who caused a protest outside our very own Time & Life Building when People magazine chose Bradley Cooper instead of him as the Sexiest Man Alive. Ryan Gosling, the 2011 Coolest Person of the Year, is so cool that he refused to talk to me about this honor. Faced with this problem, other magazine franchises might back down and pick someone willing to play ball and be their publicity monkey, but the Coolest Person Committee is committed to the truth. Also, it was getting really close to deadline, so it just seemed a lot easier to stick with Gosling. Oh, Ry, how are you so fly? To me, you'll always be the coolest-sexiest-best-hey-girling man alive, no matter what the year is.